Super members searching for a ‘sustainable’ investment fund are exposed to the same challenges as those in more traditional funds with the sector delivering a wide range of performance outcomes and charging a range of fees, according to new research on the sector by superannuation research house SuperRatings. 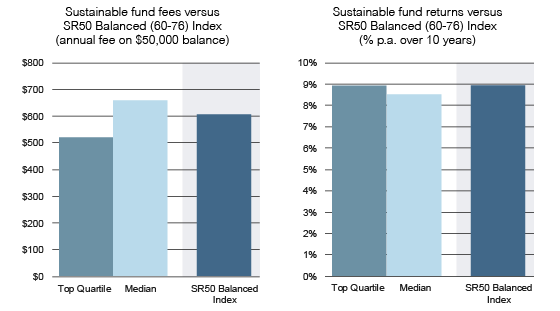 The SuperRatings research reveals that the median performance of ‘sustainable’ investment funds is lower than the median performance of the SuperRatings SR50 Balanced (60-76) Index, comprised of traditional balanced super funds. Furthermore, the ‘sustainable’ funds have higher median fees. The combination of the two means a sizeable number of ‘sustainable’ funds produce sub-optimal returns at relatively high fee levels. ‘Sustainable’ funds include funds that select their investments based on environmental, social and governance (ESG) factors. However, there are a number of ‘sustainable’ funds that outperform the market, while some also have lower fees than many Balanced options. The chart below reveals that the top quartile of sustainable funds charges a total fee of $519 or less per annum on a balance of $50,000, compared to the median SR50 Balanced (60-76) Index fee of $606. Looking at returns, the top quartile of ‘sustainable’ funds has delivered a 10-year return of 8.9% or more per annum, which is in line with the SR50 Balanced (60-76) Index. The below table shows the top returning super funds that are classified as sustainable due to the fund’s incorporation of ESG and socially responsible investing criteria. HESTA’s Eco Pool balanced option has delivered the top return over 10 years of 11.1% per annum, which is considerably higher than the SR50 Balanced (60-76) Index return of 8.9% per annum. There are a range of factors that must be taken into account when assessing the extent to which ESG factors affect a fund’s investment decisions, as well as the cost involved. For example, some funds may apply a simple screen on certain industries, while others may conduct more in-depth analysis on individual businesses, which may justify a higher fee. This makes it difficult to provide a definitive ranking of sustainable fund performance. 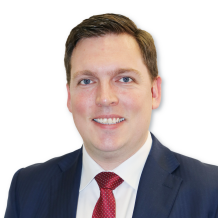 When considering sustainable alternatives, it is important to look at each individual fund’s mandate, their process for investing sustainably, and of course the industries and businesses they do and do not invest in,” said Mr Rappell.